secretlondon popped in after work in March 2016 for a curry fix. I had idly (£2.20), mixed uthappam (£3.90), and gulub jaman with ice cream (£3.90). Both of the savoury dishes came with the same three sides — sambar, coconut chutney, and a couple of chutneys (I think) in the same container. My uthappam was pretty hot, with green chilli on. I'm normally pretty good with chilli, but I had to pick the chillis off as it was too hot. Last visited by secretlondon, March 2016. 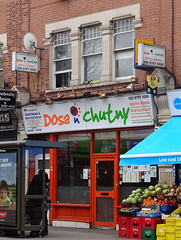 Opening hours taken from the Dosa N Chutny website, June 2018. Last edited 2018-06-11 19:24:05 (version 5; diff). List all versions. Page last edited 2018-06-11 19:24:05 (version 5).